First Line: The letter from Aunt Inga arrived, as the saying goes, a day late and a dollar short. If Aunt Inga had put the correct amount of postage on the letter, Avery Baker might have arrived at the elderly lady's old house in Maine in time to find out what she needed help with. As it is, when Avery arrived, her aunt was dead and Avery found herself the heir to her aunt's estate-- including one very neglected Victorian house. What at first seemed like a huge inconvenience turns out to be a blessing in disguise. Avery sublets her New York City apartment, quits her job as a textile designer, and moves to Waterfield, Maine-- intent on renovating the old house in order to sell it for as much money as she possibly can so she can move back to New York. Hiring handyman Derek Ellis to help her with the renovations, Avery soon realizes that some of the facts just don't add up, and that her aunt's fall down the staircase was not a case of an old lady losing her balance. She has to find out what's going on before she's the next one to have "an accident." Mysteries that have the renovation of an old house at their centers are one of my reading weaknesses. It was good to see that Bentley didn't merely use the renovation as a springboard for the plot and then ignore the work done on the house. Avery is a complete novice. Her skills lie with textiles-- textures, colors and patterns. She's never tried to bring an old house back to life. The man she hires, Derek Ellis, has, and it's hilarious to see his burgeoning sense of horror as Avery talks about bringing Manhattan industrial loft-style chic to the old Victorian home. It's also fun to watch their attraction to each other grow. Although I knew the identity of the killer as soon as I saw his shoes, the why of the crime totally escaped me even though the author put the reason right out in plain sight. My only defense is that I was enjoying the story and the characters too much to pay close attention. 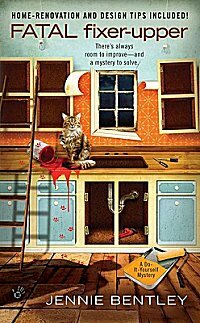 The good news is that Avery plans to keep on renovating in future books, so I'll get to enjoy the chemistry between the former textile designer and the handyman, the do-it-yourself tips, more wonderful old houses, and a solid cast of secondary characters in this fun series. Cathy - I know just what you mean. I've had stories like that, too, where the solution to a mystery was right there, but I was busy enjoying the characters or the setting or the context. Glad you enjoyed this one! I liked Fatal Fixer-Upper quite a bit, but the second book, Spackled & Spooked, was a bit too obvious for my taste. I am not even the type to try and figure it out, but it was right there. I might continue with them at some point because I really liked the first one. Dorte-- I thought it might appeal to you!